Get all the info you need on patio fireplaces, and prepare to install a stylish and attractive fire feature on your exterior patio. 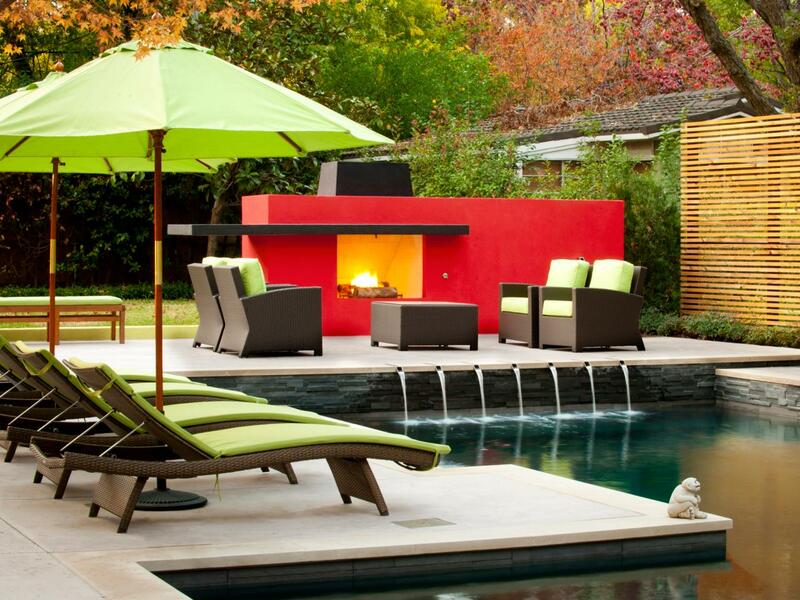 This outdoor patio next to the swimming pool contains a bold red fireplace with sleek lines. 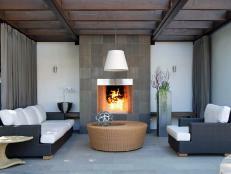 Patio fireplaces are becoming more and more common features of contemporary homes. They can add great ambience, comfort and functionality to any outdoor living space, offering a natural gathering, entertaining and even cooking spot. You'll have many options to consider when it comes to patio fireplaces, from ultra-high end, custom built units to simple, portable models available at your local home improvement or outdoor specialty retailer. 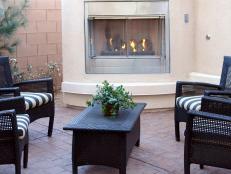 One of the first considerations you'll need to address if you're contemplating an adding a patio fireplace is location. The placement of any outdoor fire feature should initially be driven by safety requirements—for example, you'll want to steer entirely clear of any low-hanging branches, bushes or shrubbery. 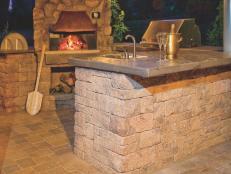 Any patio fireplace should also rest on top of a fire-resistant mat. After you've ruled out any unsafe locations, you'll want to consider things like convenience and intended use. 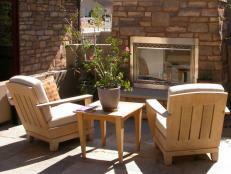 Is your patio fireplace intended mainly as a gathering space for cozy conversation? Will you use it for cooking and host meals nearby? 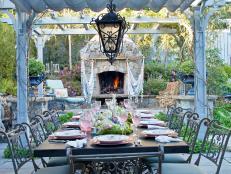 How many guests do you anticipate hosting regularly? All of these factors will help determine whether your fireplace is directly adjacent to the house and close to or apart from other cooking features—they also may go a long way to determining the scope and size of the fireplace. When you've determined the location for your patio fireplace, it's time to think about the type and style you'll feature. You'll have many choices, from traditional wood-burning fireplaces, to portable, electric-powered ones, but your first decision will likely boil down to whether or not you want your fireplace to be a permanent, built-in fixture, or a prefabricated, modular or portable unit. 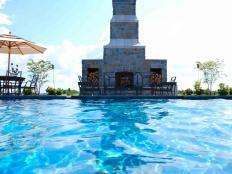 For a custom, built-in patio fireplace, you'll need a contractor and/or stone mason, as well as a design plan including details for everything from the foundation to the finish. If you're interested in a slightly more budget approach, you may want to consider a prefabricated or modular model, available from many home improvement or outdoor specialty retailers. You can often choose a blank base template, then adorn it with any number of finishes, from stone and stucco to granite and metal. There are also models available pre-finished, for even more convenience. 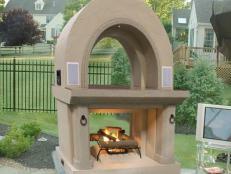 Finally, you may opt for a portable model or chiminea for your patio fireplace—a great benefit of this choice is that you can locate your fireplace anywhere on your patio that meets safety requirements. 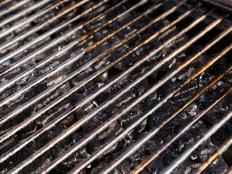 Lastly, you'll also need to decide on the fuel source for your patio fireplace—traditional wood, gas, propane and electric are the choices here. Wood is widely available, and probably featured as the fuel source for the widest variety of fireplaces. Gas will require a connection to your home's or municipality's gas line, but it offers an efficient and environmentally friendly option. Propane is a similarly efficient choice, but it will require connection to a tank that'll need to be filled. Finally, portable electric fireplaces work like electric heaters and feature faux flames and embers plus artificial fire logs. 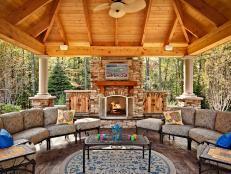 Brush up on your options for outdoor propane fireplaces so you can create a warm and cozy backyard oasis. 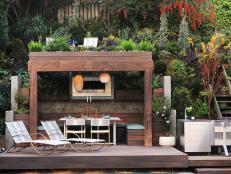 Outdoor hearths offer style with boundless entertainment options, as well as opportunities for builders to provide the finishing touch to an outdoor space. Browse outdoor fireplace options, and get ready to install an attractive, warm and welcoming fireplace in your outdoor living space. Get all the information you'll need on outdoor fireplace plans, and prepare to install a warm and welcoming gathering place in your external living space. Get all the info you need on outdoor wood burning fireplaces, and get ready to install a traditional, warm and welcoming fireplace in your exterior living space. Explore your options for outdoor stone fireplaces, and prepare to install a sturdy and elegant outdoor fireplace in your external living space. Get the info you need on small outdoor fireplaces, and get ready to add a convenient and efficient fireplace to your external living space. Explore your options for outdoor fireplaces with grills, and prepare to install a warm and welcoming gathering and cooking space in your external living area. Explore your options for an outdoor pizza oven fireplace, and get ready to install a cozy and comfortable gathering and cooking space in your external living area.